Yup… you’re reading it correctly… I make Doctored Chocolate Chip Cookies. Oh, and I doctor them with WINE. Don’t believe it? Try this recipe and let me know what you think after trying this yourself. They’re amazing. I’ve mentioned before that I cook using The Force, right? This recipe I created started with the basic Nestle Tollhouse Chocolate Chip Cookie recipe that is wonderfully simple but fun to alter. I’ve been making this recipe for decades now and am going to share this recipe with you. I will warn you that I tend to tweak this recipe from time to time, so feel free to add your own special touch to create your own version. It started innocently enough… at our second duty station (USNA), M had just been assigned as the O-Rep (Officer Representative) for the Varsity men’s soccer team. M came up with the great idea of making a large bag of cookies for each of the guys on the team for their birthday. I’d make up a batch of homemade cookies, put them into a gallon freezer bag, and he’d drop them off at Main Office for the boys to pick up. So many times, parents weren’t able to get treats to their kids in time for a birthday, so this was our way of stepping in to make the boys feel special. I started making cookie dough whenever I had time and then would freeze balls of dough so I could bake cookies anytime there was a birthday. As I got better at cooking, my freezer became an inconvenient place to store balls of frozen cookie dough and I ended up making cookie dough and keeping it in the fridge, scooping out dough as needed. With two boys and their friends always around our house, a batch (or even a double batch) didn’t sit around for long…. and it still doesn’t. I also found that I have a definite preference in using Butter flavored Crisco instead of butter or margarine… as the cookies bake, they don’t seem to flatten as quickly as those made with butter/margarine and the chocolate chips seem to stay softer for a longer time. I think they rock… maybe it’s worth a try if you’re feeling so inclined. Note: On the Crisco package, there is specific information on “how to substitute Crisco shortening for butter or margarine in your favorite recipes”… says to add 2Tablespoons of water to 1 cup of Crisco to mimic 1 cup of Butter or Margarine. This is why I started adding liquid to my cookie recipe. In a small bowl, mix the flour, soda, and salt together and set aside. In a small measuring cup, blend together eggs, spices, extracts, espresso powder, and wine. In large mixer bowl, whip together the Crisco and sugars until light. Slowly add in the egg mixture and beat until well incorporated. Gradually add flour mixture and blend until dough is mixed thoroughly. Gently blend in all three types of chocolate chips. If preferred, put all cookie dough into an airtight container and allow to sit in the fridge until you want to bake a tray of cookies. When cooking, drop by teaspoon (or small cookie scoop) onto a baking sheet. Bake at 375 degrees for 10-12 minutes. In my oven, I bake for 11 minutes and then remove and allow baked cookies to set for a few minutes before removing them to a wire rack to cook completely. Oh, and I believe that I also added 2 teaspoons of blood orange balsamic vinegar to this most recent batch… it added a nice touch of acid against the heavy sweetness of chocolate and sugar. I’ll be incorporating this into my recipe as long as I can continue to find that special vinegar… it’s totally worth the search! These are amazing chocolate chip cookies… I hope you’ll consider trying this recipe out for yourself. 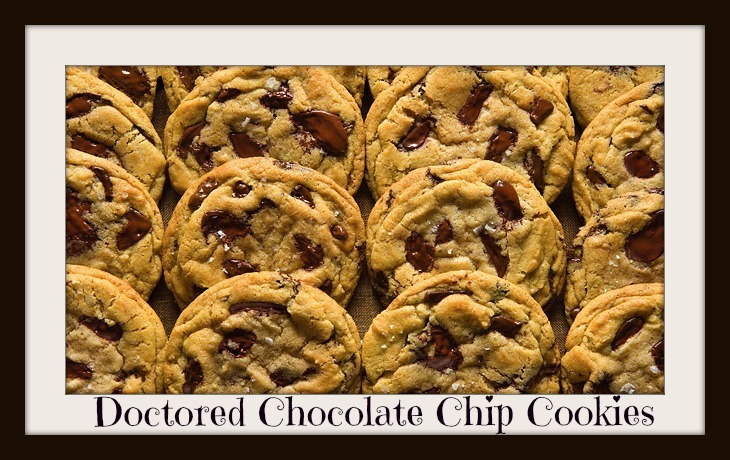 Maybe you’ll come up with a favorite ingredient to add that creates your own special chocolate chip cookies. Have fun out there! This entry was posted in Recipe, Wine and tagged chocolate, chocolate chips, cookies, James River Cellars Meritage, James River Cellars Rad Red.